Skyrim is a popular, addictive game that is available on your Xbox 360 console (as well as PC and Playstation 3). 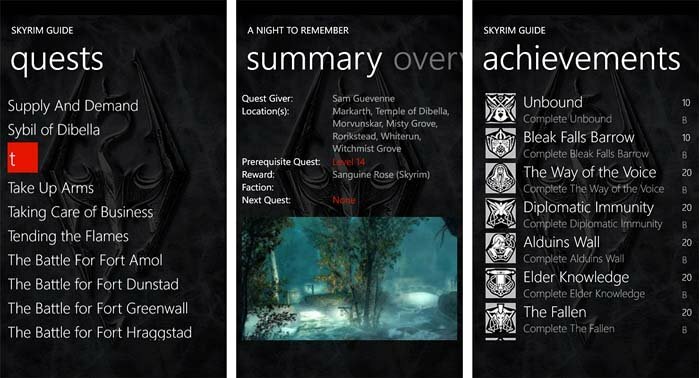 Skyrim Guide is a rather nice resource guide for the console game that is available over at the Windows Phone Marketplace. I've just discovered Skyrim and there is a lot to this game. Every where you turn an new cave, village, or encampment pops up. Skyrim Guide is designed to help you make heads and tales of all the quests, skills, character types, spells and other aspects of the game. Having all this information on your Windows Phone may help you avoid taking an arrow to the knee. Skyrim Guide's main pages are spread across three screen. You have your index page for all the categories of information, an about page, and a disclaimer page that basically says the app is not affiliated with Skyrim's developers. The index page has tiles to look up information on quests, skills, characters, spells, bestiary and achievements. Just tap on one of the tiles and you are sent to detailed pages on each. You will have either an alpha listing of information or a series of side-swipable pages. For example with quests, you will pull up an alphabetical listing of all the quests in the game of Skyrim. Tap on a quest and you'll pull up summary, background, walkthrough, and bug listing pages. Skills on the other hand has multiple pages for each skill set (combat, magic, stealth, etc.) that lists each individual skill in that category, which (when tapped) in turn will pull up more detail. Each category contains a healthy amount of information and while I wouldn't have minded seeing a more uniformed layout, what's in place works. While I liked Skyrim Guide, there is room for improvement. There is a lot of information with this app and to get to it means you have to drill down a ways. All of which means you have to hit the back button several times to return to the main pages. I think a "home" button would a welcomed improvement and make navigation a little easier. And while I'm in a suggesting mood, Skyrim Guide lacks a search feature. I think with the volume of information the app contains, a keyword search would be helpful when you're not exactly sure what you're looking for. This may be a little on the picky side but the application also needs to make better use of paragraphs. Some of the details are rather extensive (mainly the walk throughs) but lacks paragraphs. This gives the app somewhat of a cluttered feel to it and makes following the information a little challenging (especially when you're trying to play the game). Paragraphs would give things a cleaner look and make the text easier to scan. While there is room for improvement with Skyrim Guide it is a very nice app to help you work your way through the near endless game play of Skyrim. While Skyrim Guide may not prevent a dragon from devouring your character, it may help you avoid making a wrong turn. Skyrim Guide is a free, ad support app that you can grab here at the Windows Phone Marketplace.